1. Differing in one or more respects; not alike. 2. Characteristic of being different. 1. The fact, or state, of being different in one or more respects. 2. A point of difference or distinction. 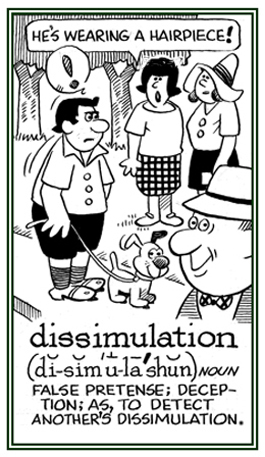 In a dissimilar manner or in a varied style. To make or to cause someone or something to become different from others. 1. The act, or process, of making or becoming different. 2. The process whereby one of two, or more, identical or similar sounds in a word is changed or omitted; as in the pronunciation (LIGH ber" ee) for "library". A condition or quality of differing in one or more respects from someone or something else: Although the girls were twins, the dissimilitude between them was astonishing because they were unlike in many ways; including their hair color, their noses, and their mannerisms! 1. The process of hiding under a false appearance: Christine smiled, indicating the dissimulation of her urgency after falling on the slippery sidewalk. 2. 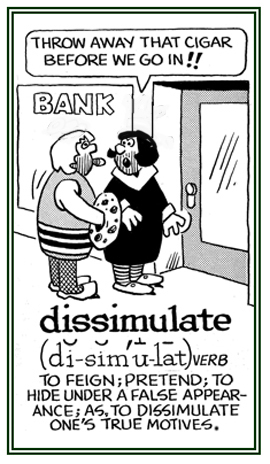 Etymology: from Old French, from Latin dissimulationem; from dissimulare, "to conceal, to disguise"; from dis-, "completely" + simulare, "to pretend, to simulate". © ALL rights are reserved. 1. Concealing under a false appearance with the intent to deceive; such as, dissimulative arts. 2. Disguised as; for example, one's intentions which are expressed under a feigned appearance. A person who professes beliefs and opinions that he, or she, does not have in order to conceal real feelings or motives; a hypocrite, a phony, or a pretender. 1. A group of musicians, dancers, or actors who perform together with roughly equal contributions from all members. 2. A number of different items of clothing and accessories, put together to create an outfit. 3. Something created from a number of individual parts deliberately put together. 4. A section of a larger musical work; such as, a ballet or opera, that all the cast perform together. Translation: "And so of similar (people or things); and that goes for the others, too." This phrase is used to suggest that whatever has been spoken about one person or topic under discussion holds true for related matters as well. The phrase ab uno disce omnes has similarities: "from one example, learn about all" or "from one, learn all". Translation: "Do thou the like [similar]." 1. An exact copy, or reproduction, of something; such as, a document, a coin, or somebone's handwriting. 2. 3. A method, or device, for transmitting documents, drawings, photographs, or the like, by means of radio, or telephone, for exact reproduction elsewhere. An abbreviated form of "fax" is normally used for "facsimile messages". From an etymological perspective, it is redundant to say, "Would you make a facsimile of this document, please." The term facsimile came from the Latin phrase fac simile, meaning "to make similar", and it was at one time written in English as two words. In its first recorded English use, facsimile meant "the copying of anything; an imitation". Showing page 2 out of 4 pages of 59 main-word entries or main-word-entry groups.